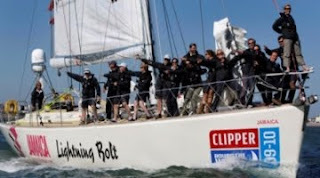 Wednesday’s Boat Name of the Day is "Jamaica Lightning Bolt" - one of the contenders in the Clipper Round the World Yacht Race. Participants in the ten month challenge began the race last month and are about to enter into the ITCZ (Inter Tropical Convergence Zone), more commonly known as the Doldrums. More about this race at today’s Daily Boater.